Spring is in the air and in the kitchen of The Shed at Glenwood. 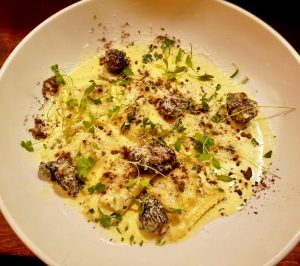 In honor of The Shed’s new spring menu and National Ravioli Day on Wednesday, March 20, 2019, The Shed’s Executive Chef Quintles Swain has prepared an easy-to-follow Butternut Squash Ravioli recipe made with black truffle zest, morel mushrooms, aged parmesan, oregano, and butternut squash puree, that will have any pasta aficionado coming back for seconds all season long. Place a stock pot filled with water and a pasta strainer on the back burner over med-high heat. When water comes to boil place seven ravioli in pasta strainer, and cook until tender. In a sauté pan over Medium heat add grape seed oil and minced garlic to the pan and sweat for 1 minute. Add heavy, oregano, butternut squash puree and salt/ pepper to taste to make you sauce, cook at Medium heat until it thickens. Add ravioli, toss in pan with sauce then transfer to pasta bowl. Finish by garnishing with shaved parmesan, black truffle zest, and micro parsley. Hungry diners looking to make reservations for a date night out in bustling Glenwood Park are also invited to nosh on The Shed’s new spring menu including fresh favorites such as Wagyu Beef Bulgogi, Steak of Pineapple, Pan Seared Scallops and Charred Leek, Steak and Potatoes, PEI Mussels, and of course the Butternut Squash Ravioli, and much more. For more information, visit http://www.theshedatglenwood.com/ or call 404.835.4363. The Shed at Glenwood is located at 475 Bill Kennedy Way SE, Atlanta, GA 30316. 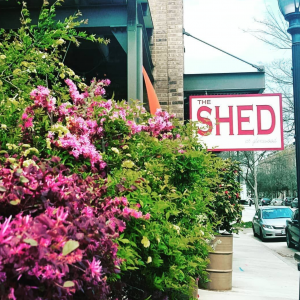 The Shed at Glenwood is open on  Tuesday from 5:30 p.m. to 9 p.m., on Wednesday and Thursday from 5:30 to 10 p.m., on Friday and Saturday from 4 p.m. to 11 p.m., and on Sunday from 10 a.m. to 3 p.m. for brunch and 4 p.m to 9 p.m. for dinner. Stay connected on Facebook and on Instagram at @theshedatglenwood and on Twitter at @TheShed1.